Further to our review post about inflatable kayaks, we thought we would also cover hardshell kayaks for general recreational use. This article will focus on recreational kayaks for beginners and a couple for more serious kayakers. Decide if you want a sit-on-top kayak or a sit-in cockpit. Personally, I prefer proper cockpit kayaks – otherwise, you might as well buy a paddle board with an attachable seat. Sit-on-top kayaks can also give you a backache if the seat isn’t decent. Decide on your budget – Under $500 is a good entry level amount. Decide if you want a one or two-person kayak. Are you going for fun or solitude! 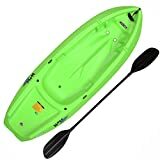 All the recreational hardshell kayaks below can be bought on Amazon, delivery of large items will need a scheduled Amazon delivery. The Sun Dolphin Aruba is an excellent entry level kayak for beginners. The cockpit is large enough to not feel claustrophobic and give you enough room to store your day pack. Inside the cockpit, you have an adjustable seat and foot holders so you can find your perfect comfort position.The outside of the cockpit is also padded for protection. The kayak is made of a tough, durable plastic which is very hard to crack…even if you do hit a few rocks! The weight of this kayak is 18KG and has handles, so easy to carry by women and children. The Aruba comes in five different colours. Note: Paddles NOT included. 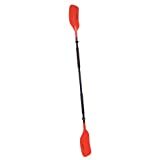 We recommend that you also add AIRHEAD AHTK-P2 Deluxe Kayak Paddles to your order. Riot is a Canadian company who specializes in building quality kayaks. Most of the cheap Sun Dolphin kayaks are probably mass produced in China. 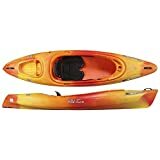 This is an awesome touring kayak for beginners if you can afford to pay a bit more and looking to take things a bit for seriously. The super-sleek design of this kayak means it cuts through water very smoothly, allowing you to gain more speed and distance with little effort. A properly designed kayak makes a huge difference to your paddling efficiency. 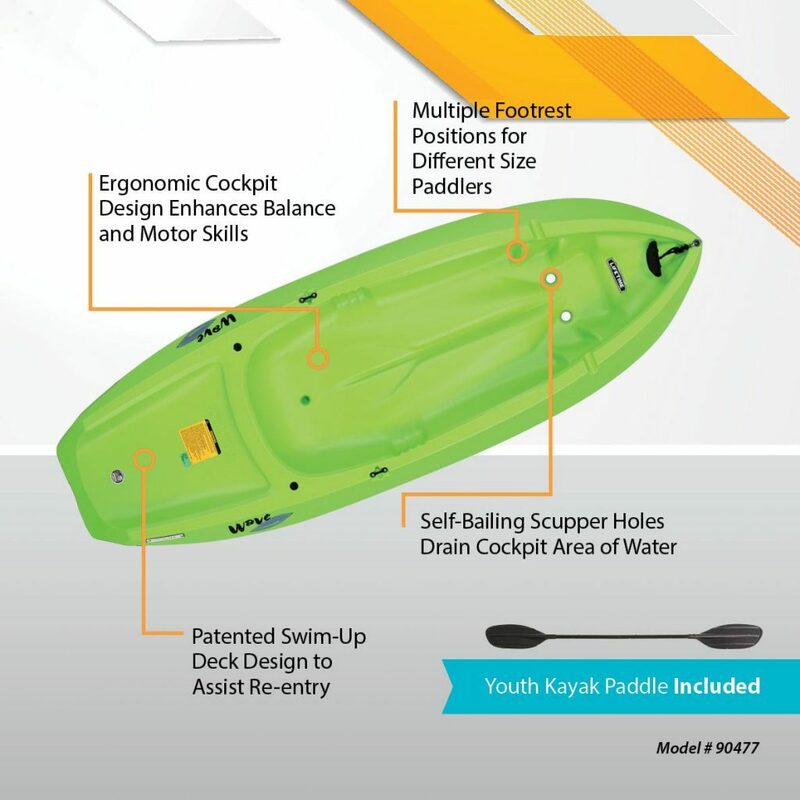 This recreational kayak also comes in an 11ft and 13ft length, depending on your needs. The cockpit of this kayak is a lot bigger than it looks in the images above, see this video below for a better overview of the Riot Edge. Old Town Canoes is one of the few companies that only specialize in canoes and kayaks. They have a great range of products to meet all needs from fishing kayaks to serious kayaks. The Vapor 10 is a great little recreational kayak due to its size of 10 ft, making it easy to carry, store and transport to your desired location. The Vapor 10 is a single person kayak meant for lakes and gentle streams and has a total weight of 47 lb. The Vapor 10 recreational kayak also has a very comfy adjustable seat and glide track foot brace to keep you feeling stable. This Kayak can hold a lot of weight. One of our product testers weighs 320lb and found it comfortable and spacious, she even managed to take her 70lb mastiff in the kayak too! The Vapor 10 Kayak can easily be transported on any vehicle, just buy a pair of low-cost butterfly racks. Lightweight, 44 Lb design; Maximum weight capacity- 250 Lbs. This is a great kayak from Lifetime. With a total length of 9ft and weight of 44lb it’s one of the easiest kayaks to carry and transport. Though it’s a small kayak, it can carry a lot of weight – 250lb. 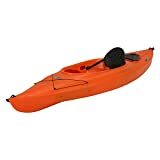 This kayak has a spacious cockpit, carry handles and comes in bright orange. The Lifetime Payette also comes with a 5-year warranty. This is a great kids kayak to start them out on the water! We bought one for our 8-year-old son and take it down to our local bay at weekends. He spends hours in it messing around. This kids kayak is low cost and comes with a paddle. This children’s kayak is built for kids aged 5+ years with a total weight capacity of 130lb, which is 9 stone. The kayak only weighs 8lb so they can easily carry it in and out of the water. It also has a neat ‘swim up deck’ on the back to help them get inside from the water. It comes in 4 different colors to suit boys and girls (pink available). Note: Ensure you also buy a kids life jacket or PFD.